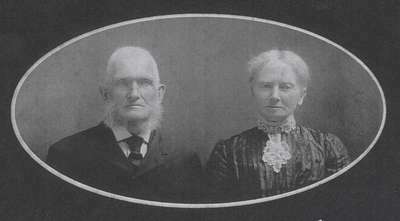 The Bussells were early settlers in Trafalgar Township. James received the Crown land that had been given to his father in 1836. He built the house that is now designated as a historic place in 1865. The house stayed in the family until 1908. Please click on the Historic Places link here to read about the beautiful house. Please click on the Heritage Mississauga link to read about the area of 9th Line and Derry Roads, McCurdy's Corners. Many of the family are buried at St. Stephen's Anglican Church in Hornby, Ontario and the cemetery records can be found on the internet. James Marcus Bussell, b. 1824, d. February 10, 1907. Margaret IElliott) Bussell, b. 1839, d. March 31, 1905.